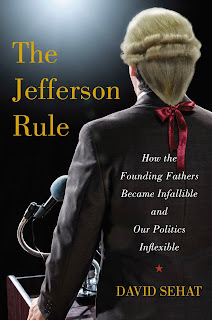 I recently spoke with historian David Sehat about his new book, The Jefferson Rule: How the Founding Fathers Became Infallible and Our Politics Inflexible (Simon & Schuster 2015). JB: Your last book was about religious freedom. Why did you decide to write a book about how the founders have been used (and misused) in American political rhetoric? David Sehat: People in politics often refer to the Founders to justify their particular vision of religious freedom. My first book called into question that impulse. But as I finished that first book, the 2009 Tea Party began. I found the historical malapropism and anachronism of the Tea Party pretty astonishing, but I knew enough to realize that what they were doing wasn't entirely new. So I decided to write a book about how the rhetoric about the Founders began and to evaluate its consequences over time. JB: You describe Jefferson as being the first President to really wrap himself in the founding, all the while changing its political meaning to suit his political program. He plays St. Paul to the founders' Jesus. He turns the principles of 1787 into the principles of 1798. One of the big themes of your book is that this general approach to the founders has had unfortunate consequences for American politics from Jefferson's day to the present. Why do you think that's so? David Sehat: In battles with the other Founders, Jefferson constantly referred to "the true principles of the Revolution." He accused his opponents of "heresy" and "infidelity" in defense of what he called "the holy cause of freedom." The result was a palpable distortion of American constitutional meaning, changing the consolidating moment of 1787 into the dangerous states rights principles of the 1798 Virginia and Kentucky Resolutions. But even more broadly, Jefferson began an impulse, which continues to this day, to take normal political disagreement, policy disagreement, and to convert that disagreement into a dispute over first or fundamental principles. The result is a kind of apocalyptic politics. We can't just have a political disagreement based on differing values or differing policy estimations. Our dispute is evidence that one of us is engaged in bad faith and betraying founding principles. That kind of disagreement is harder to tolerate and tends to promote a no-holds barred kind of politics, rather than a politics of compromise, conciliation, and pragmatic action. JB: Reading your book, I was reminded of my colleague Sandy Levinson, who thinks that founder worship and constitutional veneration are a terrible idea and that we should junk the Constitution and start over. Do you agree that we should have a new Constitution, or do you just want people to stop invoking the founders? David Sehat: I do agree with Levinson, although I didn't make a big deal about it in the book. If push comes to shove, I prefer the idea of a living Constitution to what strikes me as the unworkable notion of constitutional originalism. But Levinson is correct when he points out that the pathologies created by the Constitution cannot be entirely fixed by living constitutionalism. No amount of living constitutionalism can change the anti-democratic nature of the Senate or the near constant election cycle with which we live. I'm reminded of the political scientist Edward S. Corwin who said in the 1930s, when conservatives were fighting the New Deal, that there was a self-reinforcing veneration between the Founders and the Constitution. The public was inclined to view the Constitution as a closed system of perfect genius that couldn't be criticized without calling into question the veneration of the Founders as well. I decided first to point out the problems with this veneration of the Founders. Then maybe we can talk about the problems with the Constitution itself. JB: One of the interesting points you make along the way is that political uses of the founding recede between the end of the Civil War and the Progressive Era. You also point out that there is a resurgence of founder veneration in the 1920s, with Warren Harding's "return to normalcy," and that Harding actually coins the phrase "the Founding Fathers." Why did this decline in founder-rhetoric happen, and why does a resurgence occur in the 1920s? David Sehat: Founders rhetoric declined because of the Civil War. Although it freed the slaves, it was a catastrophe in American political life and represented a failure of the Founding Fathers. Constitutions are supposed to channel conflict into the political arena and away from the force of arms, but that didn't happen in the Civil War. Instead, the nation tore itself apart, the foundations came apart, with all sides invoking foundational authority. So after the war, Founders rhetoric in the political arena faded for nearly two generations. Not that the Founders were never referred to, but it was nothing like before the war. I don't have a great answer for why the rhetoric returned, other than that it was politically useful. Various national shrines were completed in this period, beginning with the Washington Monument in 1884. And particularly for a conservative politician like Warren G. Harding, referring to the Founders in the 1920s became a way justifying his rejection of two decades of progressive change. JB: By the way, around the turn of the twentieth century, the corporate bar begins to defend the idea of judicial review strongly and Marbury v. Madison becomes the icon it now is today. Wasn't this conservative constitutionalism also accompanied by a revitalization of founder worship? David Sehat: I think that's right. One thing that I found hard to disentangle was the constant slippage between the Founders and the Constitution. A politician might begin by invoking Jefferson, then turn to the Constitution (even though Jefferson was not a framer, since he was away in Paris for both the convention and the ratification debates), and then shift to George Washington. I didn't get into the early twentieth century tradition of conservative constitutionalism because I decided to focus on Founders rhetoric as a way of disentangling this slippage. But clearly these debates over the Constitution and the proper mode of constitutional interpretation fed back into the political arena by the 1920s. JB: You are very hard on Ronald Reagan, arguing that, in effect, much of his presidency was a failure. But surely he was at least as successful as Andrew Jackson in shaping the politics that succeeded him. And his championing of originalist rhetoric both in politics and in law set the agenda for much of contemporary constitutional debate. In what sense should we think of this as failure? David Sehat: When I say he is a failure, I mean that he is a failure on his own policy terms. He spent nearly two decades before his presidency as a deficit hawk and as a crusader to shrink the size of government. But once in office, he tripled the size of the debt and he increased the size of the government (through military spending). He even admitted in his diary, in 1982, "We who were going to balance the budget face the biggest budget deficits ever." What I find disturbing is that no one talks about this utter failure of policy, because he successfully hid his policy failures behind his rhetoric about the Founding Fathers. In other words, I do agree that he succeeded, much like Jackson, or Lincoln, or any other consequential president, in shaping the politics that came after. I just happen to find much of that politics deeply disturbing, detached from reality, and ultimately calculating in its use of political rhetoric (and the Founding Fathers) in a way that obscures those policy failures. JB: I wanted you to say a few words about the title of your book, "The Jefferson Rule." In the early chapters it seemed that the title should be, "The Jefferson Stratagem," because Jefferson picks up the idea that the best way to establish legitimacy is to wrap yourself in the founders-- because if you don't do it, your political opponents will! As you describe them, this is how FDR, Dr. King, and Ronald Reagan seem to use the founders. But by the end of the book, when you discuss the Tea Party and the debt ceiling crises of 2011 and 2013, Jefferson's political strategy seems to have hardened into The Rule of Jefferson, or rather a caricature of the Jefferson of the Kentucky Resolution. Is this what you meant in choosing the title? David Sehat: It's funny that you say that, because we tossed around The Jefferson Stratagem along with several other similar titles. But ultimately we decided that Jefferson Rule was most appropriate because for much of American politics the stratagem has hardened into a rule or maybe even a commandment: Thou Shalt not Disagree with the Supposed Ideas of the Founding Fathers (if you wish to be a successful politician). I can only think of a few politicians who flatly rejected the relevance of the Founders (Theodore Roosevelt is my favorite), which speaks to the unspoken but still binding rule. Another way to read the title, I now see, is as something like The Jefferson Reign. And there have been times, during the debt ceiling crises and earlier as well, when I might want to make a case for that meaning of the title. But that was primarily not what I had in mind. JB: At the end of the book, you argue that American politics would be better off if we stopped talking about the founders and their values, because different politicians will read their own values into the founding. But is it clear that *this* is the problem? Lots of political symbols have multiple meanings and can be used for multiple purposes. Other countries may not invoke the founding fathers of their constitution in the way that Americans do, but they have their own national symbols that they try to appropriate for contemporary political causes. Is there any reason to think that moving away from founder-talk will improve American politics? After all, the one period where you note that this kind of talk recedes is the second half of the nineteenth century, which is hardly a normative model for the present. David Sehat: I wouldn't say that Founders rhetoric is the only problem of American politics. There are all sorts of problems--the influence of money, the negative effect of cable television, the Facebook effect in which we occupy separate political echo chambers, the constitutional problems that Sandy Levinson talks about. And none of those things go away if we stop talking about the Founders. But one thing that I learned in couples therapy is that the way that we talk to one another matters. So as much as I wouldn't say that if we stopped talking about the Founders, everything will get better, let's put it like this: I'd certainly like to give it a try to see what happens. JB: Politicians like Lincoln, FDR, and in contemporary times, even Obama, have invoked the founders to promote ideals of democratic compromise and effective government. Calling on the founders runs deep in American national culture-- we might say that it's as American as apple pie. And it's quite possible to appeal to the values of the founders to promote compromise, moderation, and tolerance. Your book contains many examples. Your real objection seems to be with people you think are ideologues and demagogues, who have bad ideas and who mislead other people. For example, it's pretty clear that you don't like the Liberty League, Ronald Reagan or the Tea Party. But it's not clear that the problem is that these people cited the founders; rather the problem is that you think their politics were misguided or that they had unrealistic expectations. Is the real lesson of the book that talking about the founders is bad for our politics, or is it that there are deep and recurrent pathologies in American politics? David Sehat: I tend to see Founders rhetoric and political pathologies as fellow travelers. They go together more often than not. When I see people like Lincoln, or FDR, or even Obama invoking the Founders, it is often as a defensive measure in response to opponents. So, yes, I do object to ideologues and demagogues--and I don't like the Liberty League et al.--but I also don't like it when people that I otherwise agree with start talking about the Founders. They, like their opponents, are almost always inventing "the Founders" as a group of people who are useful for their purposes, which offends me as a historian. Maybe it's best to think about it like this. I don't have all the answers, and I don't think that stopping discussion of the Founders is the single magic bullet. I'm just trying to point out a problem. And I'm pretty sure that more often than not when the eighteenth century Founders intrude on twenty-first century politics (or any politics after, say, 1828), we usually have a problem. So let's stop talking about the Founders and see where we are. I can only think that it will be a better place.